15 "WAKE UP DEMOCRATS! Take Back the Country"
Harold Meyerson (born 1950) is an op-ed columnist for the Washington Post and long-time Vice-Chair of Democratic Socialists of America. Executive Editor and Political Editor of the LA Weekly from 1989 to 2001, Meyerson is considered one of the most astute commentators on Los Angeles politics. Meyerson is Editor at Large of The American Prospect, an op-ed columnist for the Washington Post, and continues as Editor At Large for the LA Weekly. In 1968, at the Democratic Convention, Meyerson worked as a young aide to Senator Eugene McCarthy. Meyerson, whose parents belonged to the Socialist Party USA of Norman Thomas, is a self-described social democrat and a passionate pro-labor activist. His writing has appeared in almost every left-of-center publication, including The New Yorker, The Atlantic, The New Republic, The Nation, The New Statesman, The New York Times, The Los Angeles Times, and Dissent. In 2001 Meyerson, age 51, headed for Washington, D.C., to take up a new role as executive editor of The American Prospect, an 11-year-old, left-leaning biweekly magazine of politics and culture. Circa early 1980s Harold Meyerson was listed as an at large Los Angeles Council member for the Democratic Socialists of America. At the bottom of the list was the statement, "Change the USA, work with DSA!". On Sunday, June 7, 1981, the Los Angeles Chapter of the New American Movement sponsored a Tribute to Ben Dobbs for "His lifelong commitment to socialism". The event was held at the Miramar-Sheraton Hotel, Santa Monica, California. Sponsors of the event included Harold Meyerson. In 1982 Harold Meyerson was a committee member of the Socialist Community School in Los Angeles. Speakers at the Democratic Socialists of America 2nd National Convention, in Berkeley California, included: Nicaraguan Foreign Minister, Fr. Miguel D'Escoto, Mpho Tutu, daughter of SA Anglican Bishop, Desmond Tutu, Marta Petrusewicz, Barbara Ehrenreich, Rep. Ron Dellums, Elinor Glenn, Michael Harrington, Harold Meyerson, Paulette Pierce, David Plotke, Jim Shoch, Beverly Stein, Mel Pritchard, Jim Jacobs, Dolores Delgado Campbell, Guy Molyneux, Cornel West, Gail Radford. In 1993 Harold Meyerson of Sunland, California was on a list of “Key’ California Democratic Socialists of America contacts. In 1996 Harold Meyerson, LA Weekly was one of the original 130 founders of Campaign for America's Future. The Democratic Socialists of America 2001 National Convention took place in Philadelphia Nov. 8-11, beginning with the traditional Friday night outreach event, in this case a “public dialogue” on 9-11 with DSA Vice Chair (and American Prospect Washington editor) Harold Meyerson, Bill Fletcher (in absentia) from the AFL-CIO and Black Radical Congress, and Linda Panetta from School of the Americas Watch. 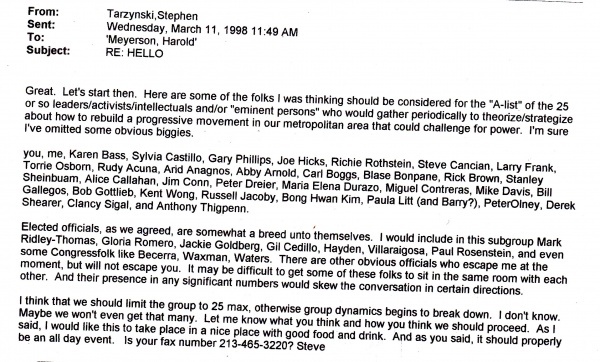 Circa 2002 , Harold Meyerson, The American Prospect, served on the Advisory board of the Democratic Socialists of America dominated Progressive Los Angeles Network. In 2000 Meyerson wasExecutive Editor of the L.A. Weekly and a Vice-Chair of Democratic Socialists of America. 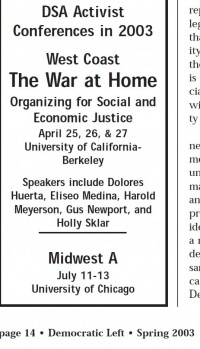 In 2003 Holly Sklar addressed a Democratic Socialists of America Conference in Berkeley, California, along with Gus Newport, Harold Meyerson and Bob Wing. At the Los Angeles conference DSA Vice Chair Harold Myerson, describing himself as a “third generation Menshivik”, discussed the continuing relevance of certain parts of the Communist Manifesto to understanding today’s “shareholder capitalism”. In 2009 Harold Meyerson was listed as the Editor-at-Large of The American Prospect. In 2018 Harold Meyerson was an original signatory of the DSA North Star founding principles statement. This page was last modified on 4 February 2019, at 03:53.